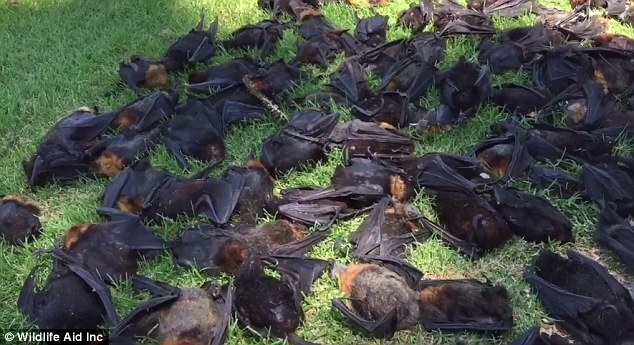 Record high temperatures have devastated bat colonies across South Australia's state capital, Adelaide, with up to 3,000 flying foxes dropping dead from trees by the end of the weekend, according to local media. At least 1,500 grey-headed flying foxes collapsed at the city's botanic gardens, parklands and riverbanks, with wildlife conservationists calling the incident the largest of its kind, the ABC news channel reported on Sunday. "By the end of the weekend, we're probably looking at having lost between 2,000 and 3,000 bats," wildlife rescue service Fauna Rescue SA flying fox coordinator Sue Westover was quoted as saying. "All of the deaths have been grey-headed flying foxes, which are actually classed as a vulnerable species now, so this is actually quite devastating," Westover said. The fruit bats are Australia's largest bat species and endemic to its south-eastern regions, with average wingspans stretching up to 1 meter and weights of up to 1 kg. "They disperse the seeds, and also pollen which creates new tree growth, new forest growth. Basically, without the flying foxes helping to spread everything, we won't have trees," Westover said. "The highest number was around 600 bats, a few years ago in the heatwave," she said. Extreme heat hit the southern state last week, with the mercury at a decade-high of 46.6 degrees centigrade in the capital alone, according to the channel. Poultry farmers also reported massive losses, with one farm losing more than half of its flock of 2,000 birds alone despite cooler temperatures toward the weekend. "It's a very catastrophic blow to our business. We have customers that rely on us through retail and food outlets so we'll just have to monitor our egg production now and see who we can supply to," Adelaide farmer Adam Oaten told the news channel. Shocking pictures show dead horses at a dried-up waterhole in central Australia. 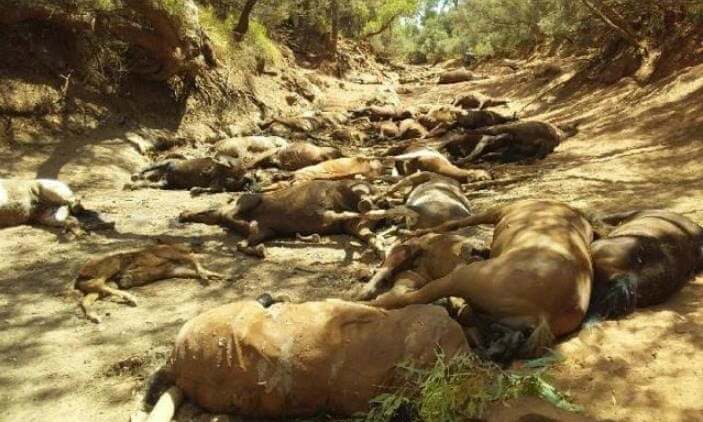 Deaths of about 40 horses discovered near Santa Teresa blamed on extreme weather conditions Forty wild horses have been found dead at a dry waterhole in central Australia in what is believed to a mass death caused by extreme weather. Shocking pictures have been published of the animals, which were discovered by rangers near the remote community of Santa Teresa last week. About 40 dead feral horses were found at the Apwerte Uyerreme waterhole and another 50 were found in poor health and had to be culled by the Central Land Council. Mass flying fox deaths, the ‘canary in the coal mine for climate change’ are dying in alarming numbers. Some areas have recorded temperatures above 48C, and bat deaths have been reported on a “biblical scale”. Temperatures above 42C kill flying foxes, and thousands have dropped dead from the trees in Adelaide, South Australia. The total dead represents a third of Australia’s spectacled flying foxes. “This sort of event has not happened in Australia this far north since human settlement,” said Dr Justin Welbergen. Ecologists have warned the impact of the heatwave could be taking a heavy toll on unseen populations of wild animals. Millions of fish have died in far western NSW as drought conditions continue to grip the state. The NSW Department of Primary Industries and WaterNSW are investigating the large fish kill in several rivers and dams at Menindee after a sharp cool change hit the region following a period of very hot weather. "The ongoing drought conditions across western NSW have resulted in fish kills in a number of waterways recently," DPI senior fisheries manager Anthony Townsend said in a statement on Monday. Jellyfish have stung more than 50,000 beachgoers on Australia's Gold and Sunshine coasts, prompting officials to issue warnings and close beaches. Safety authority Surf Life Saving Queensland said the bluebottle jellyfish -- also known as Pacific man-of-war -- have been blown in by recent winds. The surge in jellyfish numbers coincided with the record-breaking heatwave. The weather is not good news for summer grain crops such as sorghum," said Phin Ziebell, agribusiness economist, National Australia Bank. Many east coast farmers are still reeling from the winter wheat crops, which suffered from recent drought." Australia, the world's fourth-largest wheat exporter, saw the production of the grain fall to a 10-year low this year when dry weather wilted crops. With unusually dry pasture, the danger of bushfires looms. In a sense it's a new tipping point or feedback loop. The loss of these important polinators and seed dispersers will have a domino effect as Gary has mentioned. Soon sapiens will be 'Dropping like bats'. Just like all the honey bees we have lost in the USA.